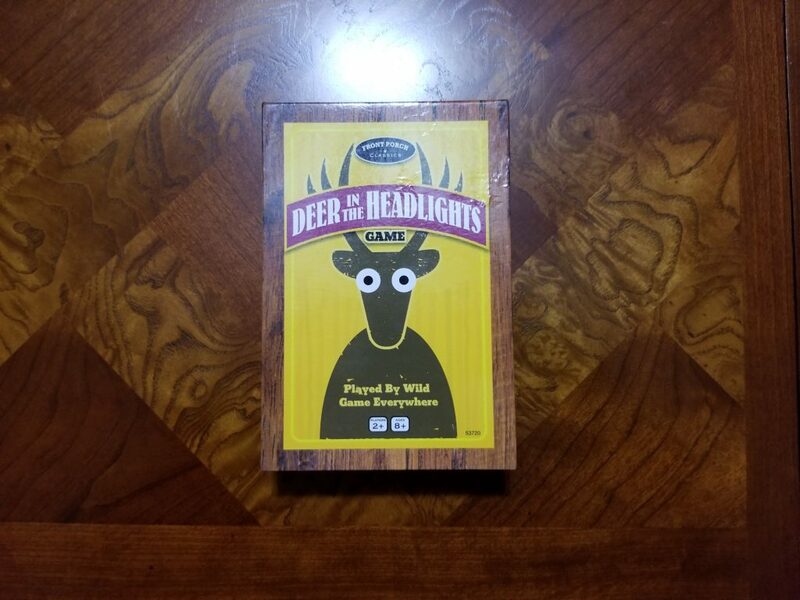 Deer in the Headlights Game Box. Deer in the Headlights is a combination card game and dice game published and released in 2014 by University Games Corporation under the Front Porch Classics brand. Deer in the Headlights includes three proprietary dice seemingly exclusive to the game as well as two full 54-card standard playing card decks. The standard playing card decks are branded on one side with the Deer in the Headlights logo, but have the same card designs on the play side you would expect to see with any deck of playing cards purchased at the local drug store. The decks even come with two jokers even though jokers are never mentioned anywhere in the rules. It is important to discard the jokers prior to beginning play. The Deer in the Headlights cards are standard playing cards. Once the jokers are removed, the first round’s dealer combines and shuffles both decks and then deals out all of the cards to everyone playing. The Deer in the Headlights instruction booklet states that the game may be played by two or more players. I would imagine the only limit to the number of players is the number of cards that may be dealt. 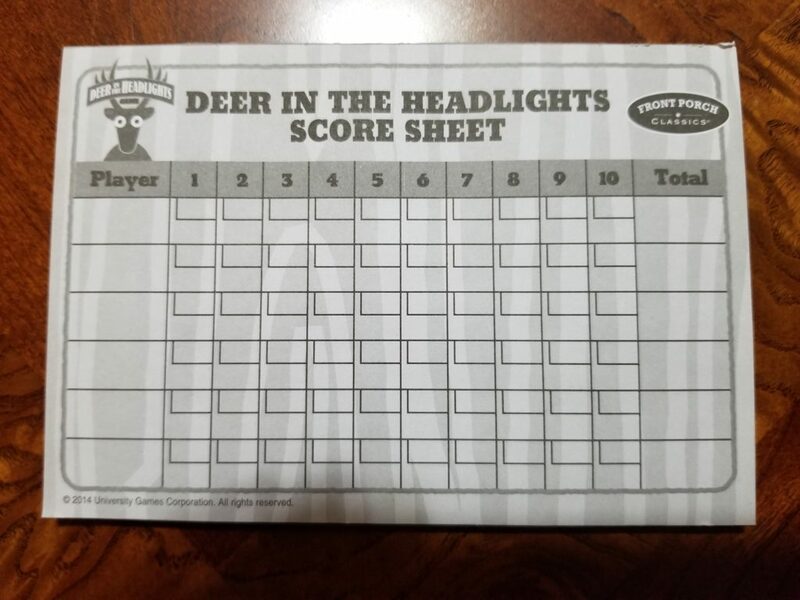 The included score pad for the game contains a slot for six players, but keeping track of player scores in a notebook or using two sheets from the score pad should be trivial. The player who manages to discard all of their cards first wins the round. At the end of the round, all other players count up their points which are then tabulated on the score sheet. Number cards are worth their number values. Jacks, queens, and kings are worth ten points, while aces are worth one point. At the end of ten rounds, the player with the lowest score wins the game. Play begins with the dealer. They roll the dice and play their turn based on what they roll. There is zero strategy involved. Deer in the Headlights is less a game and more an exercise in probability. There are three six-sided dice, one beige, one blue, and one red. The dice are the only part of the game that cannot be easily interchanged with another game or other rules. Even though this is the case, the one on the red die is meant to indicate an ace. The red die has the lowest point numbers: A, 2, 3, 4, 5, and a Deer with Antlers. The blue die has the middle point numbers: 6, 7, 8, 9, 10, and a Deer with Antlers. And finally the beige die has the highest point cards represented: J, Q, K, Car, Running Deer, and Deer with Antlers. The most common rolls are for three card values such as 2, 6, and Q. When this happens and no symbols are rolled (e.g. Running Deer, Car, or Deer with Antlers) the player who rolled may discard all of the cards that match the values rolled to the center discard pile from their hand. 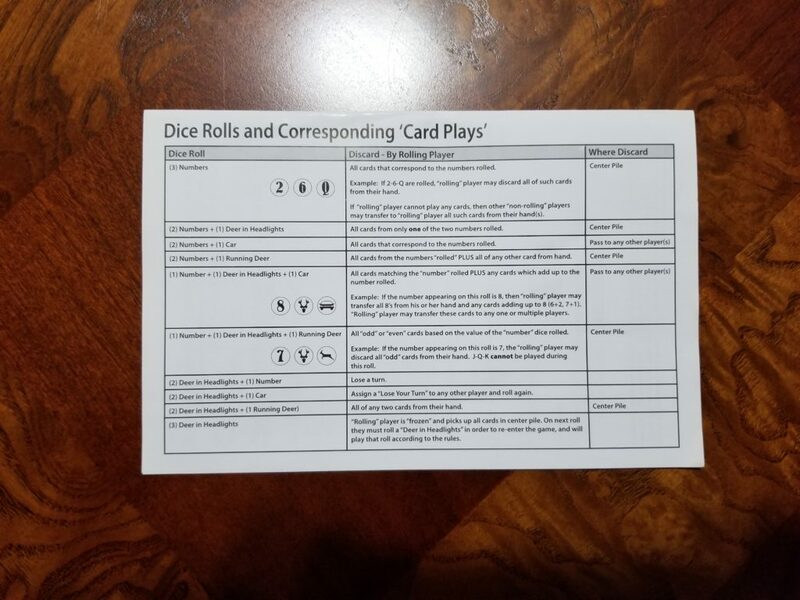 If they are unable to play any cards from their hand from this roll, any and all opponents around the table may discard from their own hand those cards and give them to the rolling player. The second most common roll is two middle or lower point numbers and a deer with antlers such as 4, 7, and a deer with antlers. When this happens, the player may discard to the center pile all of the 4’s or 7’s in their hand. Deer in the Headlights contains three dice, one blue, one beige, and one red. A more uncommon roll is to get two numbers and a car. The car essentially indicates that any cards discarded will not go to the center pile but will instead by distributed by the current player to the other opponents around the table as they see fit. 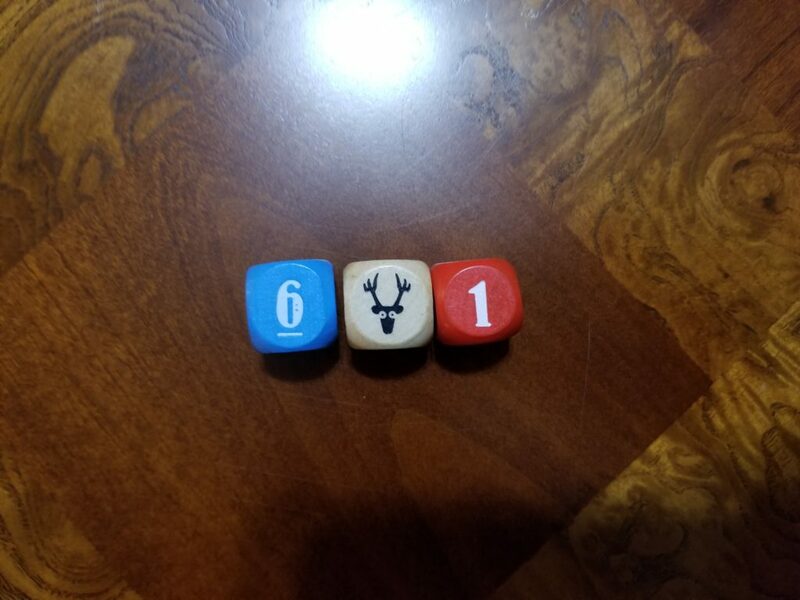 When two numbers and a running deer are rolled, the player may discard to the center pile all of the cards in their hand for the numbers shown, plus an additional wild card of their choosing. So if a 3, 8, and running deer are rolled, the player could discard all the 3’s, 8’s, and Kings they have in their hand if they were to so choose. When a number, a deer with antlers, and a car are rolled, the player may discard any card that matches the number rolled, as well as any number of cards that add up to that number. So if the player rolled a six, she could discard all of her sixes and any other combination within her hand that adds up to six. Three twos, one four and two ones, and one five and one one would all count. Because the car was rolled, all of these cards discarded are distributed to any of the opposing players the current player chooses. When a number, a deer with antlers, and a running deer are rolled, the player may discard any odd or even cards based on whether the number rolled was odd or even. So, if the player rolled a 10, she would be able to discard all of the even cards in her hand to the center pile. Face cards are not included in the odd/even count, so jacks, queens, and kings may not be discarded in this way. If two deer with antlers are rolled with one number, the player loses a turn. If however, two deer with antlers and a car are rolled, the player who rolled may select an opponent to lose the turn for them. 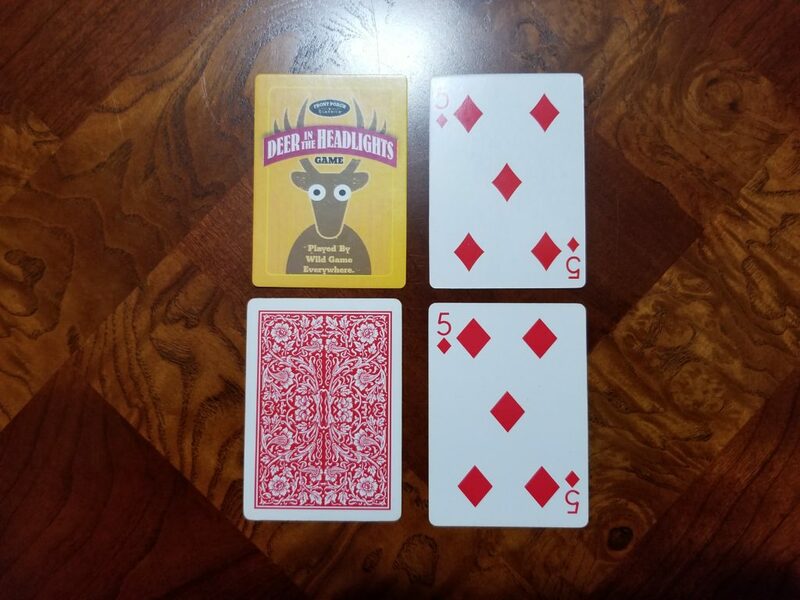 If two deer with antlers and a running deer are rolled, the player may discard all of any two kinds of cards they choose from their hand to the center pile. The most tragic move of all is to roll three deer with antlers. This “freezes” the player. They must pick up all cards from the center pile and they are unable to play a full turn again until they successfully roll a set of dice with at least one deer with antlers. This can be a real rotten game changer and has the potential to make a sore loser in a hurry. It is surprising how rare it actually ever happens, however. Dice Rolls and Corresponding ‘Card Plays’ sheet from Instruction Manual. Deer in the Headlights is a good game for teaching young children how to play basic card and dice games. Its sophistication is greater than that of Go Fish and Candy Land so parents won’t be as bored out of their minds playing it. It’s still quite a tedious game for me to play with my six-year-old son where I have my algorithm all worked out for each and every turn while he takes forever trying to figure out how many nines he has in all of the cards strewn about his hand. Given there is no strategy involved, I really can’t wait until he’s graduated from this one. Deer in the Headlights might also serve as a decent social game for people who don’t like to play games. In most rounds I have played, most players were about to run out of cards at the same time which tends to provide the illusion that a player is playing “well.” This also increases the possibility that a player will have a “good” round regardless of their level of gaming skill. For those who are new to and scared of more sophisticated games, this could be used as a gateway game to get them interested in something more complex as time goes on. This entry was posted in 2 Player, 2 Player Competitive, 2014, 3 Player, 3 Player Competitive, 4 Player, 4 Player Competitive, 5 Player, 6 Player, 7 Player, 8 Player, C100/S0, Card Game, Card Game, CRD-0011, DCE-0001, Dice Game, Dice Game, Exercise in Probability, Game Review, University Games Corporation, University Games Corporation. Bookmark the permalink.